How Can Veneers Enhance my Teeth? There are many different types of cosmetic dentistry procedure available, and one of the most commonly requested is dental veneers. Dental veneers are a popular solution for transforming the outward appearance of your teeth. They are often used as an alternative to teeth whitening, where the patient is unable to use bleaching chemicals, or has not been able to achieve the level of whiteness that they desire using professional whitening treatments. The veneers themselves are a set of thin, porcelain shells that are custom-designed in terms of shape, size and color. There are many different shades of porcelain available and this enables the patient to pick one that is white, but also looks very natural. Each veneer is applied individually to the outer enamel of the teeth in a procedure that is simple and minimally invasive. How can veneers enhance the appearance of my teeth? - Making teeth more uniform in terms of size and shape, which will improve the overall appearance of your smile. - Covering stains and discoloration, particularly that which cannot be removed by teeth whitening processes. - Hides unsightly damage such as cracks or chips. - Closing small gaps that may have opened up between the teeth. - They are stain resistant, making it easier to retain a whiter, brighter smile for much longer. - Gum tissue accepts porcelain veneers well, and so you should have little or no side effects from the procedure. Those patients who do experience side effects will usually only notice a little redness, soreness or slight swelling. - They can be brushed just like regular teeth, making them simple to maintain. - Veneers are long lasting, so a great investment in your smile. Veneers are attached to the outer enamel of the teeth using special adhesive. However, before this can be done, it will first be necessary for our dentist to file down some of the natural enamel on your teeth. This enables a good, flush fit without the veneers appearing too thick and unnatural. You will be given an anesthetic while the enamel is filed down, so you will not experience any discomfort. Typically, it takes two visits to complete the dental veneers process. During the first our dentist will take impressions of your teeth, which will be used to create your customized veneers. Then during the second, the veneers will be checked for the correct fit, and then bonded permanently to your teeth. Although it is impossible to have veneers replaced, it is important to understand that once the natural enamel of your teeth has been filed away, it will never be able to regrow. This means that you will always require a veneer over these teeth. 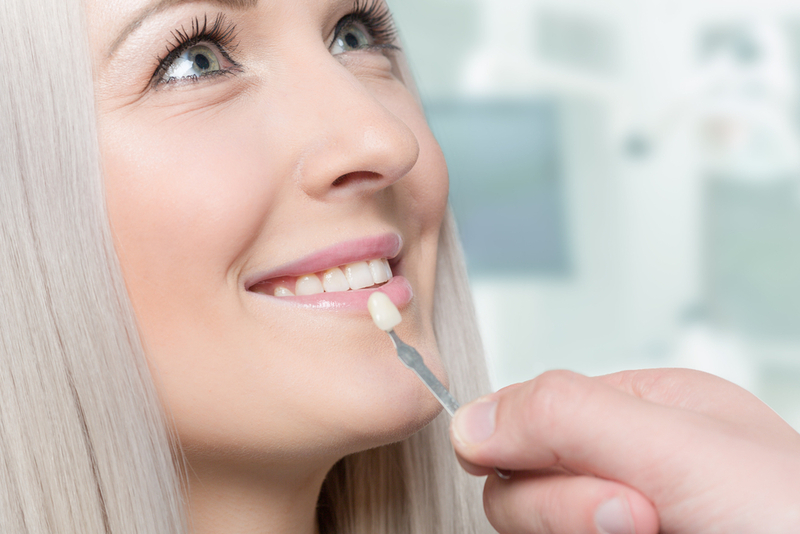 To learn more about the ways that veneers can enhance the appearance of your teeth, or to schedule a consultation to discuss your candidacy, it would be our pleasure to assist you. Please contact the team or pop into our offices.